In the e liquid review guide section we stated that the the key to transitioning from smoking to vaping successfully is to get the best e-liquid brand that you can. V2 are one of the most established e liquid manufacturers in the USA and are certainly the most popular online brand. Through working with user groups they have the created the most authentic range of tobacco e liquids – with no chemical aftertaste. The best tasting e-liquid that is a similar flavour experience to your current tobacco smoking. If you currently smoke B&H tobacco cigarettes you want a B&H e-liquid flavour for vaping. A big part of this process involves finding the best e-liquid that matches your cigarette brand, ensuring that the flavour is similar to that of the tobacco cigarettes that you smoked. If there is no similarity between the tobacco you smoke and the e-liquid flavour you are vaping it will make any transition more difficult. We review the best flavours and match these to popular tobacco cigarette brands to assist you in getting what you’re looking for. Another piece of the jigsaw is your health, that is to make sure the e-liquid you are using is properly prepared in laboratories and includes only pharmaceutical grade tested ingredients. This section provides a guide and information to users on about the e-liquid flavours and the similarities to the taste of a cigarette, so that you are guided to the most likely e-liquid that matches your cigarette taste. We have reviewed the best e liquids in the e liquid review section and recommended the ones that we believe are the cleanest and safest, because of their full disclosure of ingredients and proper reliable manufacturing process. Generally the V2 Platinum range of e-liquids is recommended, however for those allergic to PG based e-liquids 100% VG e-liquid alternative from the Vsavi or vPure range of e liquids is recommended. Here we cover the most popular cigarette brands and match them to their corresponding e-liquid flavours such as Lambert & Butler e-liquid (L&B Silver), Marlboro Gold e-liquid, B&H Gold e liquid flavours, JPS Blue and so on. It must be pointed out there is a degree of subjectivity here and as already stated the best way for you to ensure you “get the right taste” is to purchase an e liquid sampler pack that gives you all the flavours so that you can ensure you find your personal favourite option. The other issue that needs to be considered is the strength of your e-liquid. It needs to match as closely as possible the strength of the tobacco cigarette (nicotine content) you are used to. This is complicated by the fact smokers inhale cigarettes in different ways. This means that the amount of nicotine from a single puff differs between smokers, even with the same cigarette brand and strength. 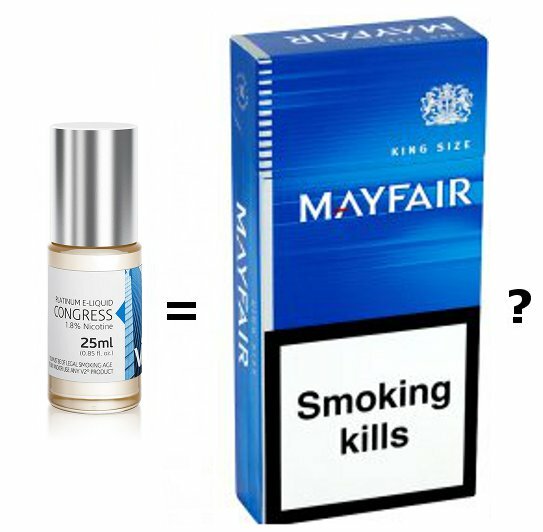 Someone wanting a Mayfair King Size e-liquid flavour equivalent may need to try both 1.2% and 1.8% nicotine strengths to get it right. 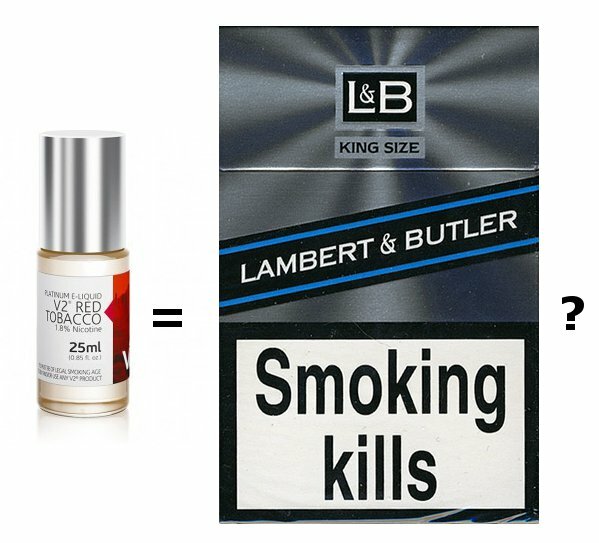 Generally, if you smoke a typical medium strength cigarette like Mayfair Kings, Lambert & Butler King Size or Marlboro King Size then a 1.8% strength PG e-liquid should give a similar experience to your smoking. However if you smoke a stronger cigarette or roll your own, and want ‘hand-rolling e-liquid tobacco’, then you may need to consider a higher nicotine content e-liquid such as a 2.4%. Conversely, if you use a cigarette with a low nicotine content and want a Silk Cut Silver e-liquid or Silk Cut Blue e-liquid, then you may need to consider 0.6% e-liquid. (Congress 0.6% nicotine e-liquid is a good match for Silk Cut Silver for example. Congress e-liquid is slightly smoother/milder than the Red e-liquid). When comparing strengths it is not correct to assume a 1.8% nicotine PG e-liquid will give the same effect as a 1.8% VG e-liquid. The rate of nicotine absorption into the body is slower with VG e-liquid so a higher strength VG liquid will be needed to match the nicotine absorption of a PG based one. Selecting your e-liquid should be a combination of finding the safest that you can buy, and choosing the right strength and right flavour that matches your familiar tobacco smoking habit. If this is done correctly then the transition from smoking tobacco to vaping an e-cigarette will be accomplished in a relatively straight forward way. Again, it is strongly recommended that you try different flavours first and then select your strength, buying an sampler pack is the easiest and quickest way to accomplish this. The only other significant factor is whether to chooses VG e-liquid or PG e-liquid. If you are really stuck and do not know where to start then one of the best tobacco tasting e liquid is the V2 Congress liquid and if you need 100% VG then Vsavi Pure Virginia Tobacco are easily the best option for a smooth cigarette type taste. Not overly powerful and not too mild. There are many more choices of flavours and strengths in the PG e liquid range – however if you find you have a bad reaction or allergy to PG e liquid then you will need to use a safe VG e-liquid alternative.